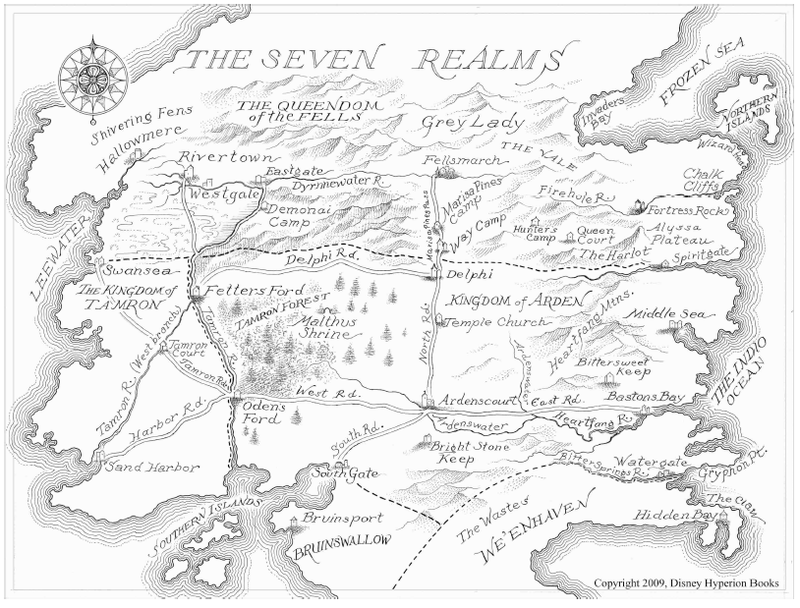 The Seven Realms Series is set in a traditional fantasy world of medieval technology, swordplay, castles and keeps. The action takes place in and around The Seven Realms—seven loosely-related realms once ruled by the Gray Wolf Queens and their wizard consorts or kings. 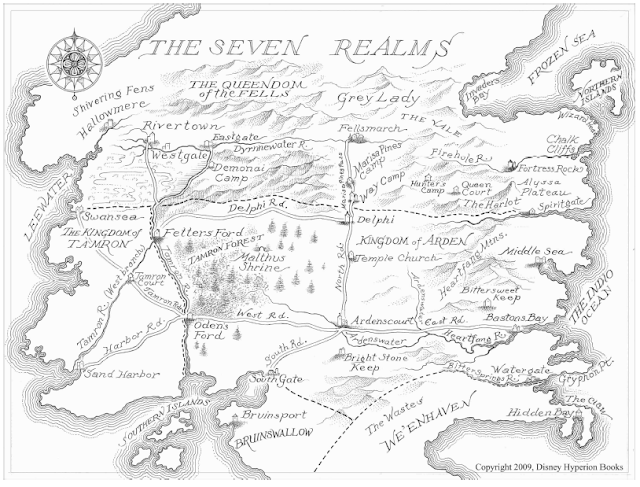 The Seven Realms include the mountainous queendom of the Fells, the kingdom of Tamron, the kingdom of Arden, the southern kingdoms of Bruinswallow and We’enhaven, the Southern Islands, and the Northern Islands. The Shivering Fens, a marshy country west of the Fells, have never been totally independent, having been claimed by Tamron and the Fells at different points in history. The Waterwalker people of the Fens consider themselves independent, and relations with the other Realms have been rocky. At one time, all of the Seven Realms were ruled by the Gray Wolf queens, whose seat of power was located in Fellsmarch, capital city of the Fells. Fellsmarch is located in a high mountain valley or park known as the Vale. The Vale is situated high in the Spirit Mountains, home of the upland clans. Flatlanders to the south claim that both the Vale and the Spirits are infested with sorcery and dangerous magic. The mountain landscape is studded with hot springs and geysers, which moderate the harsh northern winters. The Gray Wolf queens ruled in a loose alliance with the upland clans. The clans are practitioners of earth magic and masters of materials: they are masters of healing, medicines, and the makers of the amulets and other magical tools and weapons that allow wizards to use their power. Wizards have native magical ability that must be collected and channeled through amulets in order to do sophisticated charmcasting. Targeted charmcasting also requires spoken spells. Wizards are able to recognize the aura of magic in others with the gift, especially when it is unfocused and unchanneled by an amulet. A skilled wizard with an amulet continually stores accumulating power in his/her amulet, and is able to conceal his aura if he takes hold of his amulet. Non-wizards don’t see these auras. The Line of Queens in the Vale have some magical powers—a kind of intuition and the ability to lead and motivate people. They may also have other powers inherited from a mixture of blood. There is a connection between the Gray Wolf queens and their totem, the Gray Wolf. Often the appearance of a Gray Wolf portends great risk and great opportunity—a turning point in the Line. Eventually, the wizards rebelled and invaded the Fells, conquering its capital and enslaving the Gray Wolf queens through the use of powerful sorcery. The wizard conquerors subjugated the rest of the Seven Realms, but maintained the Gray Wolf line. They established a Wizard Council who chose a High Wizard who married the reigning Gray Wolf queen. That way no one wizard family became too powerful. Meanwhile, the clans maintained control of the Spirit Mountains, carrying out a constant guerrilla war against the wizard conquerors. After years of rule by wizards through the king and the Wizard Council, a dispute arose among wizards regarding who would marry Hanalea ana’Maria, the princess heir to the Gray Wolf Throne and reign as the next king. The Wizard Council chose Kinley Bayar, a Council member, as High Wizard and king. Alger Waterlow, a powerful young wizard trained in the dark arts, coveted Hanalea and the crown for himself. 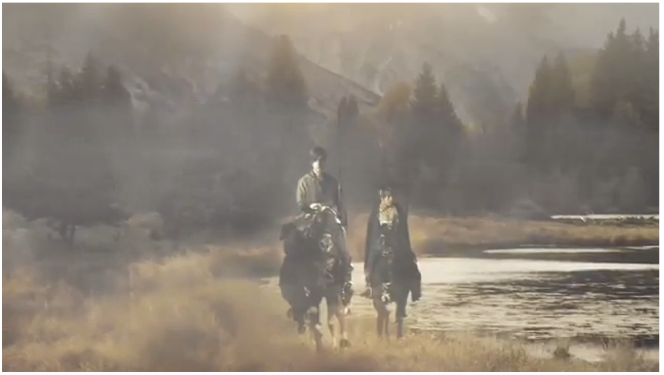 He ignored the Council’s choice and carried Hanalea off to his stronghold on Gray Lady. There he married her and proclaimed himself king. The Wizard Council assembled an army of wizards and marched on Waterlow. Realizing that his cause was lost, Waterlow used dark magic to damage the world beyond saving. This was called The Breaking of the World. The world dissolved into chaos—earthquakes, landslides, volcanic eruptions—and the Wizard Council realized they needed help or they would all die. They turned to the clans, who were masters of green magic. Hanalea served as go-between, forging the compromise between the Wizard Council and the clans known as the Nǽming. The Nǽming imposed severe restrictions on wizards and restored the Gray Wolf Line to power as stand-alone queens and established the system by which a wizard was chosen as High Wizard and counselor to the queen. These wizards were magically constrained to use their magic for the benefit of the queen and the queendom. Wizards were required to give up their amulets and magical tools in exchange for tools which conferred temporary power, renewable by the amulet masters among the clans. This provided the clans with controls over wizards in future. The queendom of the Fells thus consists of three major peoples: the Wizards from the Northern Isles, the Valefolk in the fertile Vale, and the clans, who are traders, craftspeople, and hunters in the mountainous regions. Most residents of the Fells have continued to adhere to the Old Faith. They are monotheists, worshipping the Maker and avoiding the evil counterpart, the Breaker. In the Fells, the former Queens are treated almost as saints. It is said when a queen dies, her spirit occupies one of the peaks of the Spirit Mountains, which ever after is named after her. The ancient Queens help protect the Fells from its enemies. After the disaster of the Breaking, the ancient alliance of the Seven Realms fractured. The kingdoms to the south fell into protracted strife and civil war. In the Fells, the Old Faith continued, anchored by the temples where speakers taught about the duality of the Maker and the Breaker and the Spirit Mountains, where dwelt the dead and sainted Queens. An uneasy truce had been declared among wizards, the clans, and the Gray Wolf Queens, who were bound to the land and drew their strength from it. In Arden after the Breaking there arose an influential speaker who aggressively pruned and shaped the ancient Faith in a new direction. Saint Malthus, as he was known, attributed the Breaking to the Maker’s displeasure with the charmcasters that had caused it. Magic, he taught, was not a gift, but the tool of the Breaker, and wizards were demons in his employ. The queens of the Fells had foolishly embraced this wickedness. Seduced by wizards, they were equally to blame for the Breaking. Queen Hanalea in particular was seen as a kind of beautiful witch—a seductress totally without scruples. Wizardry was forbidden under the teachings of the Church of Malthus, often punishable by death in the southern realms. The former streetlord of the Raggers and one of the main protaganists of the series. Though a highly succesful thief, widely respected and feared, Hanson left the gang to protect his younger sister, Mari, from having to enter the same life. He supported his mother and sister through odd jobs afterwards, including playing delivery for Lucius Frowsley. In truth, Han hails from the ancient Wizard House of the Waterlows and is a direct descendant of Alger Waterlow, also known as the Demon King. The last of his gifted descendants, Han has also inherited magical capabilities far surpassing those of his fellow wizards. He is also the hundreth cousin ofRaisa ana'Marianna. Raisa ana'Marianna is Queen of the Fells and the daughter of Marianna ana'L'issa and Averill Lightfoot Demonai. Her younger sister is Mellony ana'Marianna, Hanalea ana'Maria is her distant ancestor and Hanson Alister is her hundredth cousin as well as one of her romantic interests. Raisa was always headstrong and fundamentally different from her mother, causing the High Wizard Gavan Bayar to see her as a threat early on. Hayden Fire Dancer is one of the many supporting characters in the series and is Han Alister's best friend. He is of mixed blood - clan and wizard - a union that was not thought possible since wizards were forbidden by the Naeming to enter the camps. His mother is Willo Watersong, and his father is Gavan Bayer, which makes him the older half-brother to the Bayer twins, Micah and Fiona, as well as cousin to the Mander brothers. Han finds out about this whenCrow recognizes Dancer as a Bayar. Fire Dancer is a male with an angular bone structure and heavy dark brows, with jarring blue eyes set into a bronzed face. He has commented that the resemblance to his father is very striking if one knows where to look for it. Micah Bayar is the son of Gavan Bayar and twin brother of Fiona Bayar. He is a member of the Aerie House. Raisathoroughly hates him for plotting with his father and trying to steal her away from Oden's Ford. Even so, it is evident that she still has feelings for him, and that Micah has her interests in mind. He possesed the Waterlow amulet before Han got it. He took it while going on a hunting trip with his cousins, father, the queen and the princesses, and was responsible for setting fire to the mountain Hanelea using the amulet. In a conflict with Han and Fire Dancer, Micah was forced to give the amulet up when threatened at arrow point. 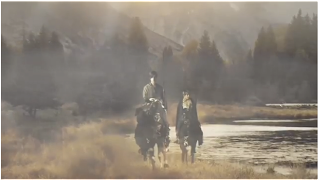 Upon meeting them again at Oden's Ford, he was shocked that Han and Dancer became wizards, choosing to believe that they cheated in order to get their powers. Want a full list of characters? Click here! Also, take a look at this Wiki, where I got the info for the characters!